Home - What is EcoHome? Anglian Home Improvements are now offering a new way to publicise the fact that you are a more discerning consumer conscious about helping the environment and saving money all at the same time. 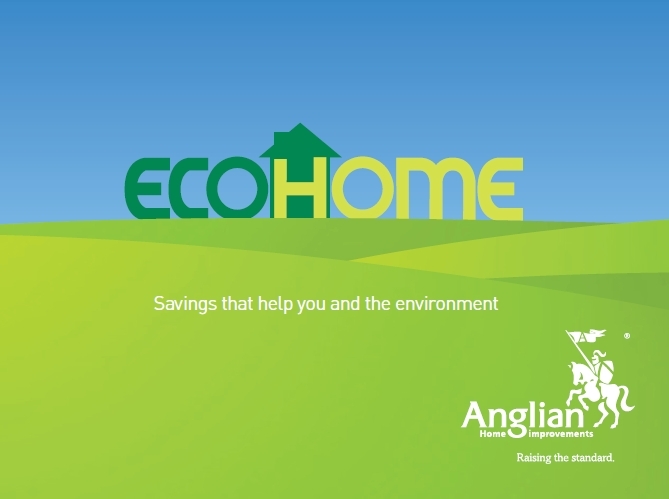 By becoming an Anglian EcoHome you will be proud in the knowledge you’re installing some of Anglian’s unique energy efficient products whilst helping you reduce your home’s CO2 emissions and lowering your carbon footprint. However, it is not just your carbon footprint that will be lowered; as an EcoHome you will earn a greater discount for advertising the fact that you are saving money and doing your bit for the environment. A neat board will be put outside your home to say that you are installing Anglian’s energy efficient products. To be eligible for the EcoHome scheme you have to install an Anglian energy efficient product, put up a board to show all your friends you are doing your bit to help save the environment, give us a copy of your previous energy bill and future bills (to analyse your savings) and finally permission to recycle your existing products in order to recoup the valuable materials within them. After installation, we will arrange for some photographs of your home to be taken, which can be used in conjunction with the savings analysed from your annual energy bill. 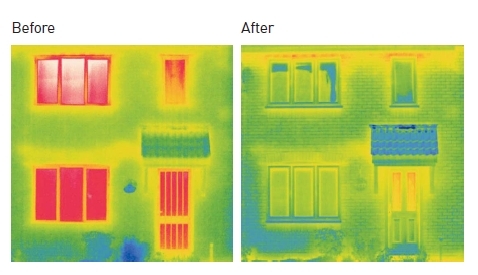 This thermal imagery demonstrates how Anglian’s energy efficient windows can dramatically increase the thermal efficiency of your home. Red, indicates high heat loss. After the installation of Anglian EcoGain windows, this is reduced significantly. But what about your old windows, conservatory and other materials removed? Well, Anglian prides itself in considering the environment with regard to any products removed or surplus to requirements! These are taken away and recycled or re-used (in the case of surplus building materials etc), giving you peace of mind that the installation really is eco-friendly. As you’re probably aware, there is a flourishing market in recycled materials and as a result of this we’re able to offer savings if you agree to the processing of your old products.